Some nights even 20 minutes in the kitchen seems like too long, am I right?? Who wants to be chopping, baking and boiling when you could be crossing off any of the thousands of other things on your to-do list? Better yet, when you could actually be having some fun?! After all, life is just TOO SHORT to be spent hiding out in the kitchen (at least that’s how I feel). Take out, fast food, or ordering something for pick up is always an option, but for many of us that can get expensive, and be a budget breaker. What you need is a quick solution. So how about Quick Family Dinner Recipes – just 15 minutes or less to the table! 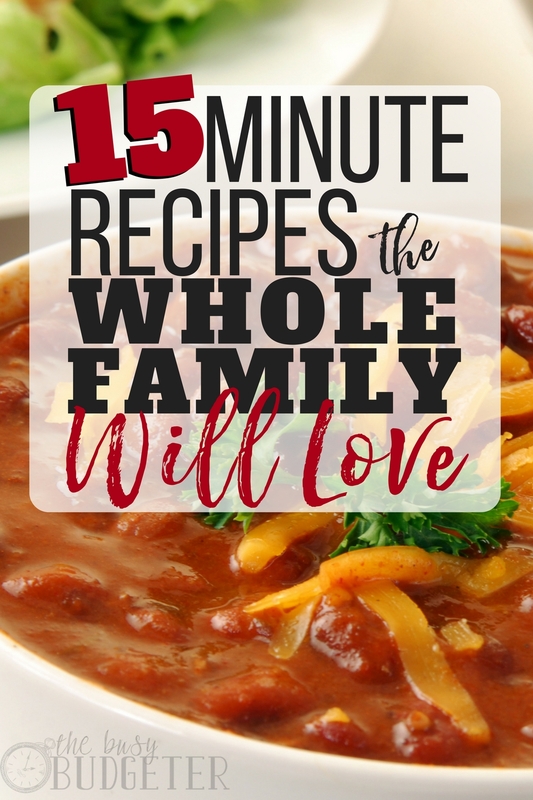 So here’s a roundup of some of my favorite quick family dinner recipes! Try a few of these quick dinner ideas today! Also, feel free to mix it up and add your own “flair” (or just use up whatever is in your fridge and freezer). Most of these can be subbed out with different veggies, ground turkey or soy crumbles instead of beef, etc. Let me know what you come up with! These wraps say “15 minutes,” but once you have the sauce-making down and your wrapping “skillz” perfected, you can totally get these together in even less time. They are SO good and they're one of my very favorite meals. 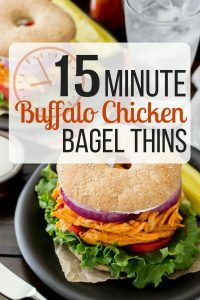 You can swap out the crispy chicken tenders for rotisserie chicken or pre-grilled pieces from the deli and it’s ready even faster! Prepare your Tex-Mex Ranch Sauce by whisking together ranch dressing, salsa, and taco seasoning in a small bowl until completely combined. Set aside. Warm your wraps in the microwave briefly (about 15-20 seconds) and lay each out on a clean work surface. Spread about 1 Tablespoon of Tex-Mex Ranch Sauce in the bottom center of the tortilla (leaving about 2 inches of space around the edges of the tortilla). Top with 1 leaf of lettuce, then two slices of tomato. Sprinkle about 1 Tablespoon of corn and 1 Tablespoon of beans over the tomatoes (try to keep everything building up on top of the lettuce — it will make it easier to wrap the finished product) and then top with a handful of chicken (about 1/3 cup). Sprinkle shredded cheddar cheese on top (about 2-3 Tablespoons) and evenly drizzle remaining ranch sauce on top of chicken /cheese. Fold the left and right side of each wrap inwards and then roll into a wrap. Secure with toothpicks, if needed. 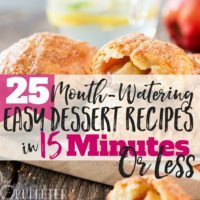 Click here for an easy, printable recipe card! These are so good, and they're great for parties and get-togethers, too. 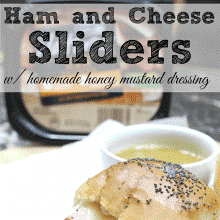 The “slider” idea makes these pretty portable and simple to serve. Plus there’s a sweet/savory/salty combination that’s out of the park. Split dinner rolls in half and stuff them with 1 slice of ham and ½ slice of Swiss cheese. Brush tops with butter and sprinkle with poppy seeds. Mix honey and mustard together and serve on the side. Head over here for an easy, printable recipe card! Oh man, chili is so good, isn’t it? 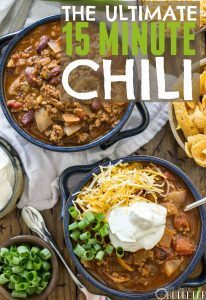 This recipe comes together fast, even though chili is one of those things you often think of as taking a long time to make. This simple chili tastes like it took a lot more effort, and the flavors are fresh and good. Make a big batch and you can have leftovers for tomorrow. Heat olive oil in a large pot. Add ground beef and onion and cook until beef is browned. Drain off excess grease. Add garlic, if using, and cook until fragrant (about 30 seconds) – If you’re using garlic powder, skip this step and add the garlic powder in with the rest of the spices below. Bring to a boil, and cook 1-2 minutes, stirring frequently. Reduce heat and simmer, stirring occasionally, for at least 15 minutes (the longer you simmer the better it will be!). Serve with preferred toppings (like sour cream and corn chips). Click here to check out all the recipes! One of my go-to secrets in the kitchen is buying Rotisserie chickens. I pick one up in the grocery line almost every week. (They’re usually less than $5 and often on 2-for-1 sale.) They smell amazing, and they can go in all sorts of recipes. 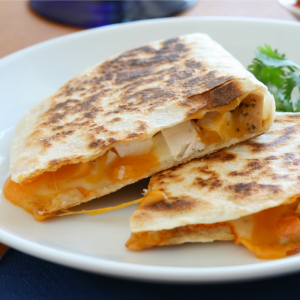 They make simple dinners like quesadillas feel like a full meal. Chop up the chicken, then add cheese and extras (try black beans, green pepper, onion, and salsa to taste) to create the filling. Place a flour tortilla in a buttered hot skillet on medium high, add filling, layer with another tortilla, turn when cheese is melting and cook the other side to a crisp. Chop up chicken. Slice strawberries and avocado. 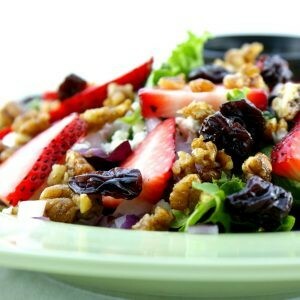 Layer chicken, strawberries, and avocado on salad greens, then add blue cheese and chopped walnuts. Combine equal parts honey, balsamic vinegar, and oil. Add a splash of lemon juice (and poppy seeds if you have them). Mix and dress the salad. Buffalo Version: Preheat oven to 400 degrees. Coat chopped chicken in hot sauce (we add some melted butter to ours). Layer a Boboli pizza crust with room temperature cream cheese, then sprinkle with ranch seasoning (the dry dip kind), then a little mozzarella cheese. Finally add the spicy chopped chicken, sprinkle with more mozzarella and bake for 10 minutes. BBQ Version: Preheat oven to 400 degrees. Spread a thin layer of BBQ sauce over a Boboli pizza crust. Sprinkle Monterey jack cheese over crust, add finely chopped chicken and red onion then more cheese. You can add extras if you have them on hand (crumbled bacon is super good!) then bake for 8-10 minutes. These little bagel sandwiches seem like something you’d get at a café, or at a nice lunch place. They’re super filling and yet another awesome use for rotisserie chicken! 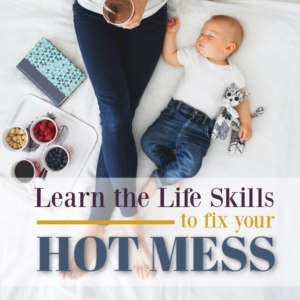 You can put them together in no time flat! Download a printable recipe card here! 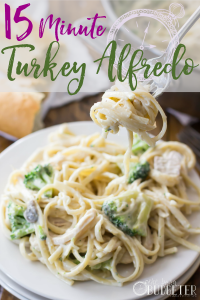 I’ll let you in on a little secret about this recipe—you don’t have to use turkey! You can use the same grilled or rotisserie chicken, if you like. However, this recipe is amazing if you need to use up some leftover turkey. Plus, it comes together so fast! While pasta is cooking, heat olive oil or butter in a large skillet over medium heat. Stir in alfredo sauce, milk, and mushrooms. Bring mixture to a simmer/slight bubbling. Add turkey and stir occasionally while pasta finishes boiling. Once pasta has finished cooking, strain well through a colander and pour into sauce mixture (don’t let pasta sit in the colander too long or it will begin to stick together). Stir well and reduce heat to medium-low. Microwave broccoli florets according to package instructions and stir into alfredo sauce until all ingredients are well-combined. Top with parmesan cheese, if desired, and serve once cheese is melty. 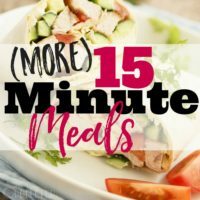 15 minute lasagna?? Sounds crazy, I know!! But while this dish doesn’t exactly “look” like traditional lasagna…guess what? It totally tastes the same! You get the melty, gooey cheese, the yummy tomato and beef flavors, and even the curly pasta, but you don’t have to do all that baking, and mixing in the eggs and ricotta and layering! This comes together in 15 minutes flat! In a large skillet over medium-high heat, combine ground beef and onion. Cook until beef is browned and onion until soft. Add water, pasta noodles, undrained tomatoes, tomato sauce, garlic powder, oregano, basil, crushed red pepper, salt, and pepper. Stir well. Bring contents of pot to a boil. Reduce heat to simmer and cook until noodles are cooked through, about 10 minutes. Stir in ricotta cheese and 1 cup mozzarella cheese, stirring until cheese is melty. Top with remaining 1 cup mozzarella cheese. Allow it to melt over the top of the dish and then serve. Break an egg into the bacon pan (Yay! Less dishes!) and fry as desired. I’m lazy, so I normally just scramble (or even microwave, if you have a microwave egg scrambler). While the egg is cooking, throw two slices of toast in the toaster. When they pop up, layer with bacon, add eggs, and top with any cheese you have available. Cheddar? Mozzarella? Monterey? Swiss? All delicious! I’m convinced any cheese makes this better. For this, you can cheat and use the rotisserie chicken again or do a little planning ahead. When you have a little time, grill up a pack of chicken breasts and freeze. (I wrap in waxed paper, and then seal in a freezer bag, removing all air.) When you need one, microwave for about 2 minutes or heat in a skillet. For Caesar Salad, I chop up romaine lettuce, heat the chicken and slice up, lay the chicken on top, add random extras that I have around – black olives, feta or parmesan cheese, diced cucumbers etc. Then just drizzle with Greek dressing. Again, use either pre-grilled chicken or rotisserie chicken works as well. For Chicken Salad, heat chicken, then dice up and mix with mayonnaise until it reaches the desired consistency, then add a little mustard (any type you have is fine), salt, and pepper. You can also use up any extra leftovers you have around: dice up and add carrots, celery, onion, green pepper, or even apples (though I wouldn’t add apples to the onion)! 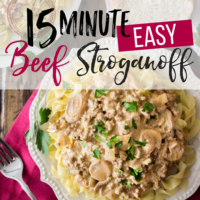 When it comes to quick family dinner recipes, this is great for when you’re in the mood for a quick dinner that still feels special. Heat your oven to a low broil and move your oven rack to the highest or next to highest level. Take any steak (This works best for well done lovers if it’s thin cut – if it’s a thick cut, don’t stress you can just reduce the oven heat to 350 and shut the door after broiling, cook it another 5-10 minutes and you’re in well done territory) and lay on your broiling pan. Add spices or a salt and pepper rub if you would like, then broil with the door propped open an inch or two for 2 minutes per side. Take it out and slice through. Is it too pink? Broil in the same way for another two minutes per side. Enjoy! Boil shell pasta as directed. While pasta is cooking, slice up fresh basil, carrots, green pepper, and red onion. Dice up pepperoni. Drain pasta and mix with veggies and pepperoni. Add feta cheese. (I buy Mediterranean feta cheese with sun-dried tomatoes and spices.) Toss with Greek dressing and serve. Most of these dishes can stand on their own, but sometimes you’re probably looking for a side to round out the meal. We usually keep our sides very simple, and I generally keep these ingredients on hand in the fridge or pantry so we can add them to our meals as we go. So the next time you’re facing the eternal “what’s for dinner” question, try one of these quick family dinner recipes to ensure you spend less time in the kitchen and more time enjoying dinner. You might even find that you can add some of these to your regular rotation. Now get yourself out of the kitchen so you can start having more FUN!! I love that you keep coming out with these lists! Food is the biggest expense for me and it’s often because the motivation to cook dinner is just lacking. Now every time I drive to pick up fast food, I always think about how Rosemarie’s way of 15 minute meals is even faster (and definitely cheaper) than driving all the way into town and waiting in the drive thru. 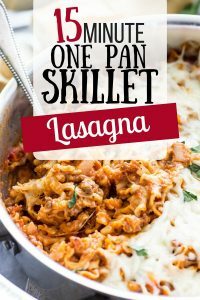 I am super excited to try the One Pot Lasagna and the 15 minute chili! I am officially very hungry after reading through all these recipes! The problem is it is almost 9pm and I have already ate dinner… Time for second dinner??? LOVE these recipe ideas! Thank you so much! I am a HUGE believer in the challenge to see how fast I can get dinner ready! Meal planning is a big part of that for me. If I don’t have a plan, I end up blankly staring into my fridge and pantry for at least 20 minutes. The same time I could have already had dinner cooked and on the table. So excited to use some of these meals in my next monthly meal plan! 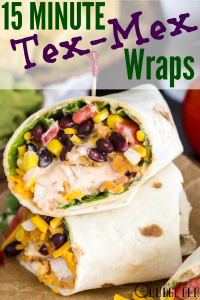 The Tex Mex Wraps especially sound good for a spring dinner! Thanks again! This post is so helpful to me.Thank you for offering it. Happy weekend ! 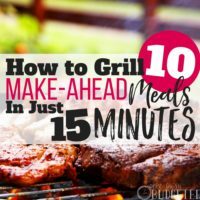 My favorite fast dinners are chicken breast or pork chops, or steak, or fish, seasoned and grilled up in a pan with a tossed salad and a (micro)baked potato or sweet potato. We often do chicken wraps, but ours are refried beans, cheese, chicken, lettuce, diced tomato, and avocado. I’ll have to try your lasagna one. Do you rain the water off after the pasta is cooked? I love the ideas! 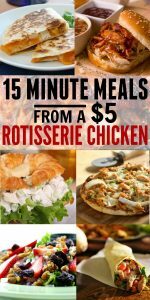 The rotisserie chicken ideas are always such a great idea because there is so much meat on those things that we can never finish one in one meal! So to have great go-to’s for using up the last of the meat is essential for really getting your money’s worth out of a great buy! 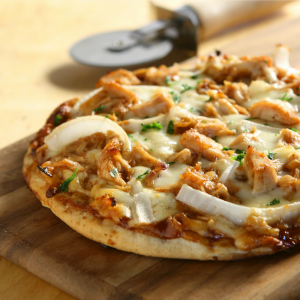 Wraps and burritos are my normal go-to, but I LOVE the rotisserie chicken pizza idea! Thanks Rosemarie! Heather recently posted…Made in a Pinch Treasures: Favorite Water Bottles – Giveaway! What a relief to find all these ideas at one place ! Thank you so very much !